Wear your heart around your neck with this Monica Rich Kosann necklace. 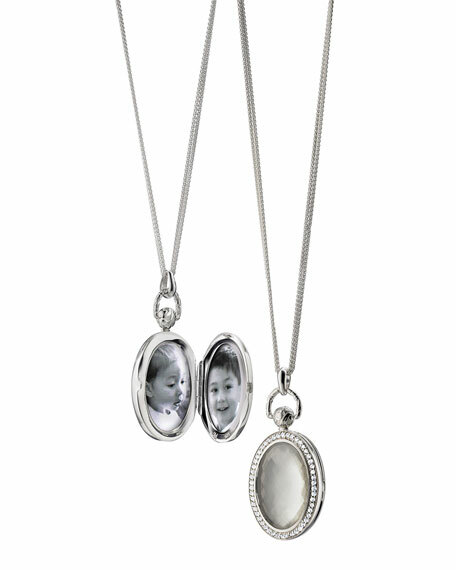 The intricately carved mother-of-pearl and bright sterling silver locket features a spot to hold a picture of your nearest and dearest. Oval locket front features mother-of-pearl-backed, faceted rock crystal doublet trimmed in pave white sapphire; floral-carved back. Pendant, 1 3/4"L x 1"W.
For in-store inquiries, use sku #265292.